False or inaccurate reporting can lead to a moral panic. This can be defined as a wave of public concern about an exaggerated or imaginary threat to society. Moral panics often surround groups who are seen as deviant or threatening – this group is known as a ‘folk devil’. 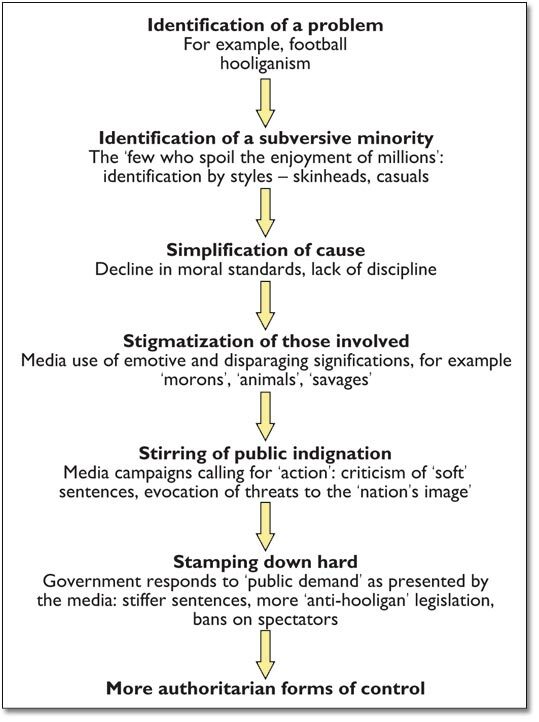 There are a number of stages to a moral panic, as shown in the diagram. The role of the media is to fuel the panic by using sensationalist language. Media generated moral panics can occur as a result of the need to attract audiences. Exciting, dumbed down news stories are a way of making money. McRobbie and Thornton argue that moral panics are less common today. This is due to the rise of news online meaning news stories are constantly being updated. The use of social media to report news has changed the way news is reported and consequently societal reaction. Events that might have caused a moral panic years ago now have a short shelf life given the constantly changing online news. Have media-generated moral panics caused society to decline?